Exploring World War I through the medium of musical theatre takes balls. 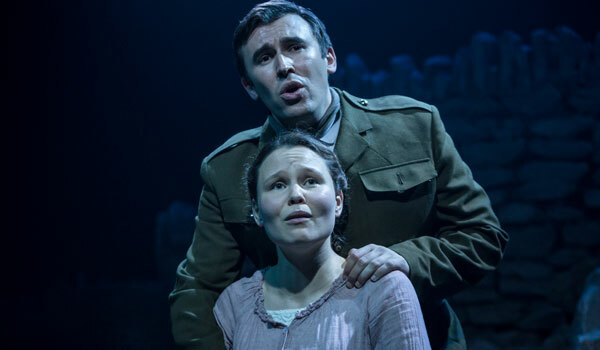 Accurately conveying the mind-melting horror of the Western Front is difficult in any medium and the prospect of all-singing, all-dancing Tommies warbling on about missing limbs and shell-shock is not an appealing one. 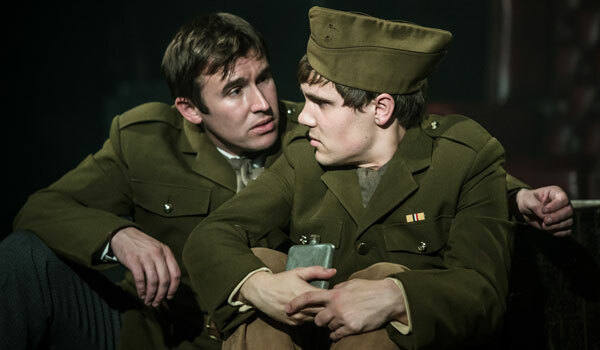 Thankfully The White Feather remains on the right side of good taste, taking the correct decision to focus its attention on the home front and explore the psychologies of the men and woman affected by the war, rather than attempt to recreate the trenches on stage. The show gets its title from the propagandist use of a white feather to symbolise cowardice. Those who refused to participate in state sanctioned murder were branded traitors, publicly humiliated by women and children handing white feathers. By denting the masculinity of the recipient, it was hoped that they'd throw themselves into the meatgrinder out of sheer shame. It worked. Set in the Suffolk village of Upton Davey, the show follows several interwoven lives. Most prominent are Georgina (Abigail Matthews) and her 16 year brother Harry (Adam Pettigrew), she's a forthright, intelligent young woman and he's a naive optimist seduced by promises of fire and glory. Intervening is the new Lord of the Manor (David Flynn) who, with his empathy for his employees and friendly demeanour, seems like an alright sort. Tossed into the mix are a bevy of ale-swilling farmworkers, prissily moralising ladies and sturdy young future cannon fodder. These tangled interactions form a rat's nest of subplots that range from clandestine gay relationships, falsification of medical records, hidden war crimes, the nascent women's rights movement and decades long political campaigns. Though the majority takes place during the Great War, we're soon zipping around a hundred years of history with stop-offs in the twenties, post WW2 Britain and even a brief sojourn to 2006. Eventually, the simple significance of the titular white feather becomes buried underneath this heap of mixed messaging. Even the crucial scene where the feather delivered is treated as a footnote whereas it should be the fulcrum on which the show turns. Fortunately, though the narrative twists and turns, there's calm at the eye of the storm in the form of Georgina. You hang onto her with dear life, Abigail Matthews providing a firm, forthright performance that functions as emotional core for the play. Matthews makes the core of the story work: a shellshocked teenage soldier being coldbloodedly executed by his superiors and his sister's battle for recognition of this crime. So it's when we head off into faintly cliched gay relationship drama that things become a bit fuzzier. Things reach the point where an out-of-the-blue final act confession of lesbian love between two minor character draws titters of disbelieving laughter from the audience, which I doubt was the intended outcome. The upshot is that The White Feather often feels less like its exploring history and more like its using the period setting as a springboard for contemporary social concerns (a smattering of contemporary sounding dialogue not helping). This isn't a complete death knell, but it does underline both a lack of focus and intellectual rigour. For example, you'd expect a show that condemns the practise of young men being suckered into a pointless war to have a great deal to say about patriotism, worship of the military and the morality of killing because you're instructed to. Now, The White Feather does briefly touch upon these things, but skims across the surface in mini-speeches that feel airlifted into an increasingly melodramatic relationship drama. Despite all this, the show can at least boast a couple of decent tunes. The sly irony of We Buried A Good Man Today is well-performed and decently written, with just the right amount of cold-blooded dark humour. Similarly, True Suffolk Man hits a relaxingly bucolic charm that goes a long way towards establishing tone and atmosphere. But it's the centrepiece, Set Them In Stone, that most impresses. It's a moving, solemn plea to honour those shot for desertion or pilloried for conscientious objection, and it's by far the best number in the show. Another string to The White Feather's bow is a decent (if not mindblowingly amazing) cast. Particular kudos to Katie Brennan's forthright proto-feminist Edith, zapping every scene she's in with energy and sly humour. Also of note is Christopher Blades', whose various roles believably conjure up the wider world behind the central drama, always adding a sprinkling of gravitas to whatever scene he's in. Ultimately The White Feather just about squeaks into success. Though it constantly fumbles the ball, at least it's fumbling the right ball. All too often there's a tendency for shows to sentimentalise World War 1, or worse, exploit it for patriotism. The White Feather recognises that the war was a crime, with the civilians of Britain manipulated towards violent deaths for no clear reason. For that alone it's a worthwhile endeavour. I just wish it was a bit more focussed. The White Feather is at the Union Theatre until 17 October 2015. Tickets here.